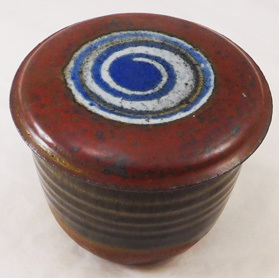 Stoneware french butter dish has a sea blue/green/brown glaze with white/blue in the center of the lid and mottled blue at the top if the base. Only one available. 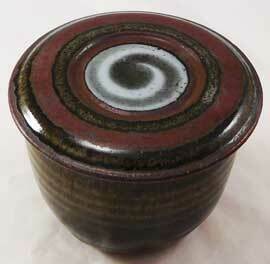 This stoneware french butter dish has a mottled red brown glaze a with tan swirl in the center of the lid. Only one available. 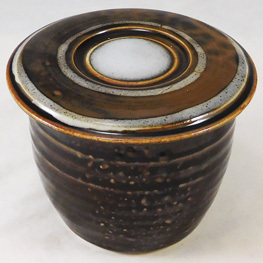 This stoneware french butter dish has a mottled brown glaze with a tan swirl in the center of the lid and mottled tan running down from the top off the base. Only one available. 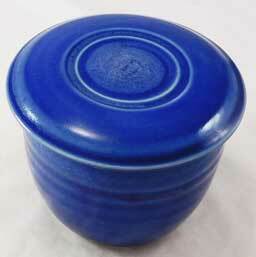 Stoneware french butter dish has a dark sea blue/green glaze with a white swirl in the center of the lid and mottled blue at the top if the base. Only one available. 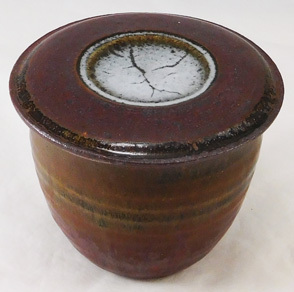 This high iron stoneware french butter dish has a red brown glaze with white and blue in the center of the lid and mossy green/white running down from the top of the base. Only one available. 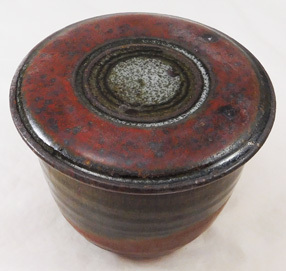 This high iron stoneware french butter dish has a mottled dry red/brown glaze with a blue and white swirl in the center of the lid and mossy green running down from the base. Only one available.